Missed University admission in 2017? Worry not. Start at Westerfield College in January 2018 and progress into second year of an undergraduate degree by September 2018. At Westerfield College, we believe that a bright future begins with the right career after secondary school. Our bespoke world-leading academic preparation is the best preparation for a degree into top universities in the USA, UK, Europe, Canada, Australia, Ireland, Hungary and the Caribbean. 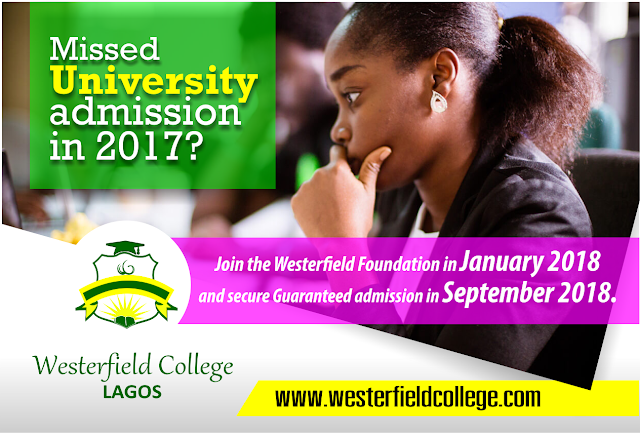 We hereby invite prospective candidates for January 2018 entry into Cambridge A-Level, UK Foundation Programme, American Transfer Foundation, Canada Foundation Programme, Nigeria Degree Pathway and Pre-Medical Foundation Programme at Westerfield College. The entrance examination starts from 9th of January, 2018. You can also meet with our representatives for a free career counseling session at any of the 6 centers in Lagos, Abuja, PHC, Uyo, Benin and Calabar.